The Australian Bureau of Statistics released the latest – Labour Force, Australia, May 2018 – today which showed that the Australian labour market weakened further over the last month. Overall employment growth was tepid and was marked by a significant decline in full-time employment and a sharp fall in monthly hours worked. 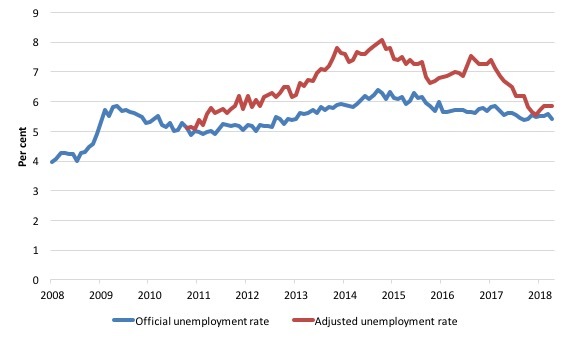 In addition, the participation rate fell by 0.2 points (rounded), which is the only reason total unemployment and the unemployment rate declined. Had the participation rate not declined, then the weak employment growth would have caused a rise in overall unemployment. The teenage labour market was the only bright spot. Further, underemployment rose by 19.2 thousand in the three months to May 2018 and the broad labour underutilisation rate remains high at 13.9 per cent. 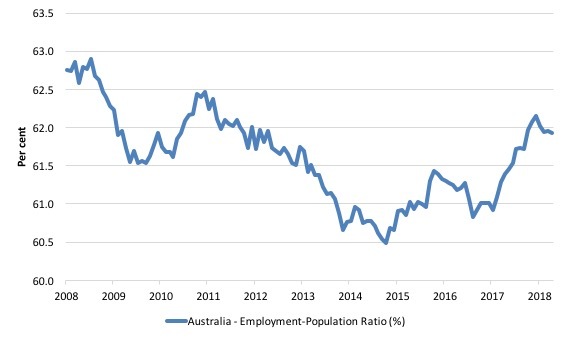 Overall, my assessment is that the Australian labour market remains stuck in a weak state and is still a considerable distance from full employment. There is a lot of slack remaining and defies the foolish calls in recent months from those demanding reductions in the fiscal deficit. Employment increased 12,000 (0.1 per cent) – Full-time employment decreased 20,600 and part-time employment increased 32,600. Unemployment decreased 26,800 to 714,600 but only because the participation rate slumped. The official unemployment rate decreased by 0.2 points to 5.4 per cent. The participation rate decreased by 0.2 points to 65.5 per cent, which is still below its previous peak (December 2010) of 65.8 per cent. Aggregate monthly hours worked decreased 24.2 million hours (1.4 per cent). The estimates for the May-quarter 2018 show that underemployment rose by 19.2 thousand and was estimated to be 8.5 per cent of the labour force. The total labour underutilisation rate (unemployment plus underemployment) was steady at 13.9 per cent. But this is due to the decline in the unemployment rate that followed the slump in participation (so not a good sign). There were 1,123.9 thousand persons underemployed and a total of 1,838.6 thousand workers either unemployed or underemployed. Employment recorded another modest increase at 12,000 with employment decreasing by 20,600 and part-time employment increasing 32,600. The pace of growth declined in May. 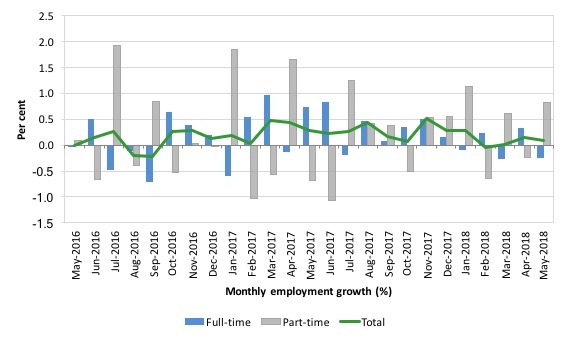 Over the last few months we have seen this pattern – weak overall employment growth, and full-time and part-time increasing and decreasing alternatively. We observed a zig-zag pattern in total employment growth up until the end of 2016 switching around the zero growth line. The oscillating pattern has continued into 2017 but the level has risen above the zero line. The following graph shows the month by month growth in full-time (blue columns), part-time (grey columns) and total employment (green line) for the 24 months to May 2018 using seasonally adjusted data. And the trend is decidedly down in the first months of 2018. Overall: today’s result signals a sustained weaker labour market. Overall there have been only 95.9 thousand jobs (net) added in Australia over the last six months while the labour force has increased by 100.5 thousand. The result has been that unemployment has risen by 4.6 thousand. 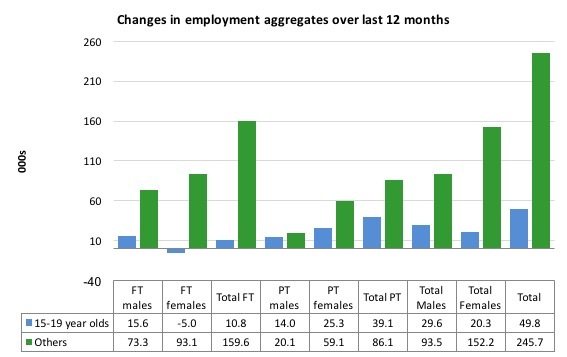 These aggregate changes signify a very weak labour market. The ratio fell by 0.1 points in May 2018 to 61.9 and remains well below pre-GFC peak in April 2008 of 62.9 per cent. 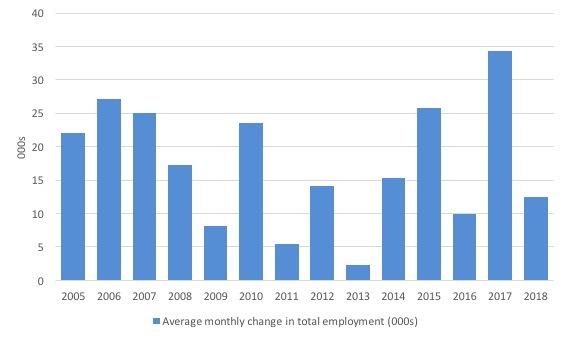 To put the current monthly performance into perspective, the following graph shows the average monthly employment change for the calendar years from 2005 to 2018 (the 2018 result is up to May only). It is also clear that the labour market has weakened considerably in the first five months of 2018. The 2018 average is up to May only so is not definitive. Total teenage employment rose by 8.4 thousand jobs in April, which was the dominant share of the 12,000 net jobs overall that were created. 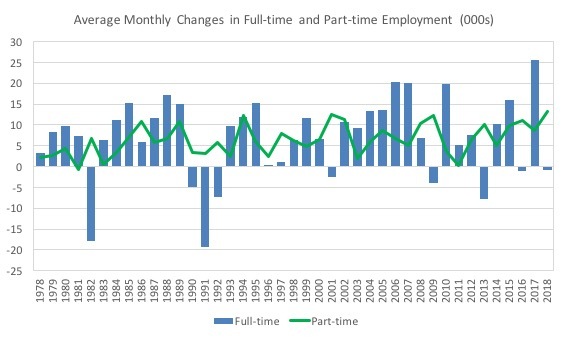 Full-time teenage employment rose by 8.4 thousand, while part-time employment fell by 100. Over the last 12 months, teenagers have gained 49.8 thousand (net) jobs overall while the rest of the labour force have gained 245.7 thousand net jobs. Teenagers have gained around 12 per cent of the total net employment growth over the last 12 months but only represent around 6.2 per cent of the total labour force. So they are doing relatively better in that sense. 1. 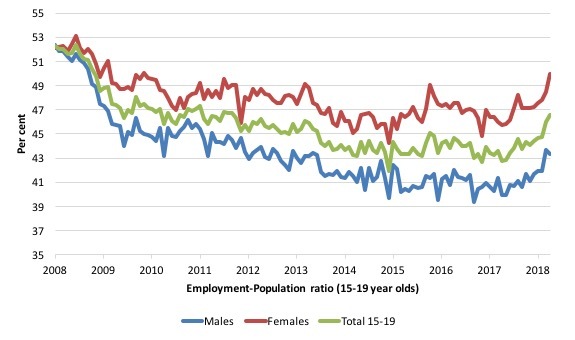 Since February 2008, there have been only 1,870.7 thousand (net) jobs added to the Australian economy but teenagers have lost a 57.8 thousand over the same period. That loss has fallen significantly in the first months of 2018. 3. Even in the traditionally, concentrated teenage segment – part-time employment, teenagers have gained only 44.6 thousand jobs (net) even though 9990.4 thousand part-time jobs have been added overall. The facts are that the absolute loss of jobs reported above is depicting a very difficult situation for our teenagers. Males, in particular, have lost out severely as a result of the economy being deliberately stifled by austerity policy positions. In the latter months of 2015, with the part-time employment situation improving, there was some reversal in the downward trends in these ratios. That improvement seems to be gathering pace despite the sluggish overall labour market. The male ratio has fallen by 9 percentage points since February 2008, the female ratio has fallen by 2.2 percentage points and the overall teenage employment-population ratio has fallen by 5.7 percentage points. In May 2018, the participation rate was 54.8 per cent (down 0.8 percentage points). The difference between the 2008 level, amounts to an additional 89.7 thousand teenagers who have dropped out of the labour force as a result of the weak conditions since the crisis. If we added them back into the labour force the teenage unemployment rate would be 23.4 per cent rather than the official estimate for May 2018 of 15 per cent. Overall, the performance of the teenage labour market remains fairly poor although clearly May 2018 was a good month. 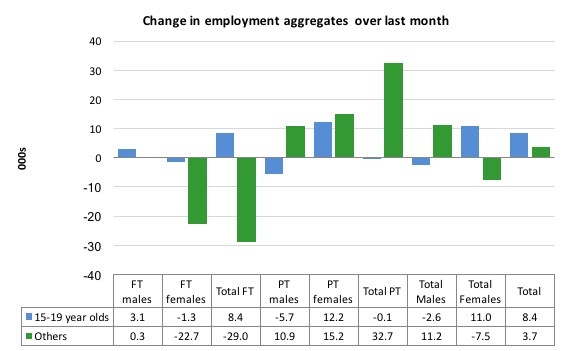 The official unemployment rate decreased by 0.2 points to 5.4 per cent in May 2018 on the back of the subdued employment growth and a falling participation rate (see below). The following graph shows the national unemployment rate from February 1978 to May 2018. The longer time-series helps frame some perspective to what is happening at present. It is now still 0.5 points above the level it fell to as a result of the fiscal stimulus and 1.4 points above the level reached before the GFC began. The ABS publishes monthly and quarterly labour underutilisation data. The quarterly data for the May-quarter 2018 was published this month and relates to the last three months. 1. Underemployment rose by 19.2 thousand and was estimated to be 8.5 per cent of the labour force. 2. The total labour underutilisation rate (unemployment plus underemployment) was steady at 13.9 per cent. But this is due to the decline in the unemployment rate that followed the slump in participation (so not a good sign). 3. There were 1,123.9 thousand persons underemployed and a total of 1,838.6 thousand workers either unemployed or underemployed. 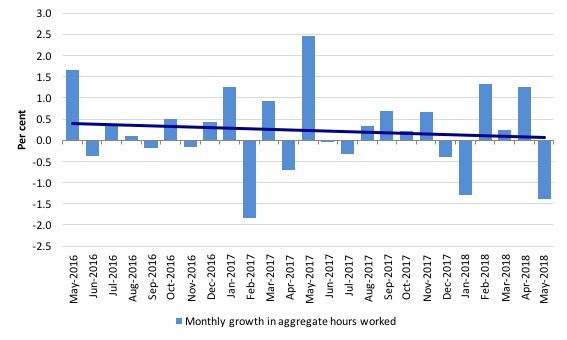 So even with continued (albeit weak) employment growth, the Australian labour market has nearly 1.9 million workers available for work who cannot find sufficient hours. 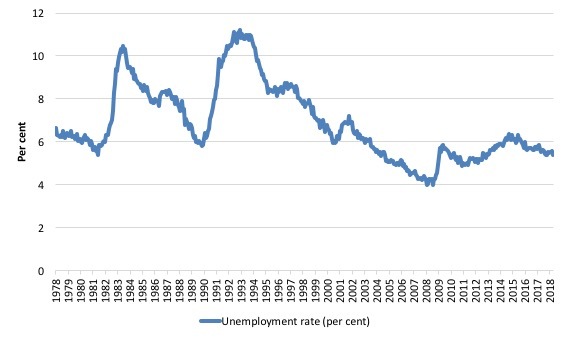 If hidden unemployment (given the depressed participation rate) is added to the broad ABS figure the best-case (conservative) scenario would see a underutilisation rate well above 15 per cent at present. 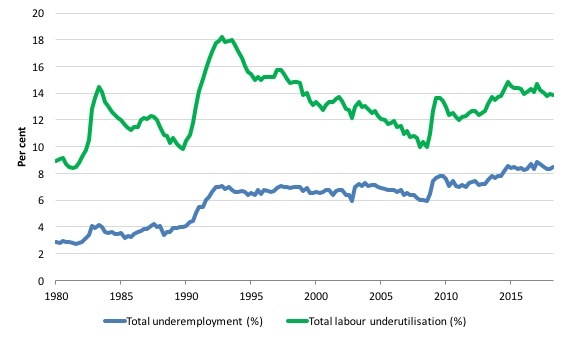 Please read my blog – Australian labour underutilisation rate is at least 13.4 per cent – for more discussion on this point. Even with the tepid employment change, total unemployment (and the rate) fell because of the decline in participation. Unemployment fell by 26,800 this month but if the participation rate had not fallen, total unemployment and the unemployment rate would have risen. The fall in the participation rate meant that there were 31.1 thousand workers dropping out of the labour force (relative to what would have occurred had the participation rate remained unchanged). The net result was that the labour force declined by 14.8 thousand (rounded). If the participation rate had not have fallen, total unemployment, at the current employment level, would have been 745.7 thousand rather than the official count of 714.6 thousand as recorded by the ABS – a difference of 31.1 thousand workers (the ‘participation effect’). Thus, without the fall in the participation rate in May 2018, the unemployment rate would have been 5.6 per cent (rounded) rather than its current value of 5.4 per cent. The conclusion is that hidden unemployment rose slightly in May 2018 along with underemployment – a sign of a weakening situation. 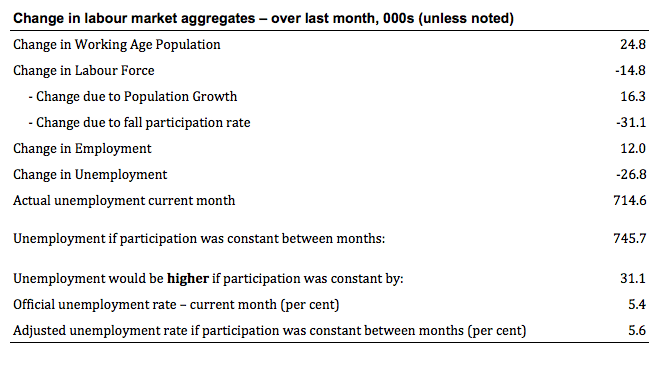 There is considerable monthly fluctuation in the participation rate but the current rate of 65.5 per cent is still below its most recent peak in November 2010 of 65.8 per cent. What would the unemployment rate be if the participation rate was at the last November 2010 peak level value? The following graph tells us what would have happened if the participation rate had been constant over the period November 2010 to May 2018. The blue line is the official unemployment rate since its most recent low-point of 4 per cent in February 2008. With the rise in participation in recent months, the red line has fallen but is still above the actuall unemployment rate. 1. Total official unemployment in May 2018 was estimated to be 714.6 thousand. 2. Unemployment would be 780.4 thousand if participation rate was at its November 2010 peak. 3. The unemployment rate would now be 5.9 per cent rather than the official May 2018 estimate of 5.5 per cent. The difference between the two numbers mostly reflects, the change in hidden unemployment (discouraged workers) since November 2010. These workers would take a job immediately if offered one but have given up looking because there are not enough jobs and as a consequence the ABS classifies them as being Not in the Labour Force. There has been some change in the age composition of the labour force (older workers with low participation rates becoming a higher proportion) but this only accounts for less than 1/3 of the shift. The rest is undoubtedly accounted for by the rise in hidden unemployment. This gap shrinks as participation rises relative to the November 2010 peak. Hours worked – decreased by 24.2 million hours (1.38 per cent). 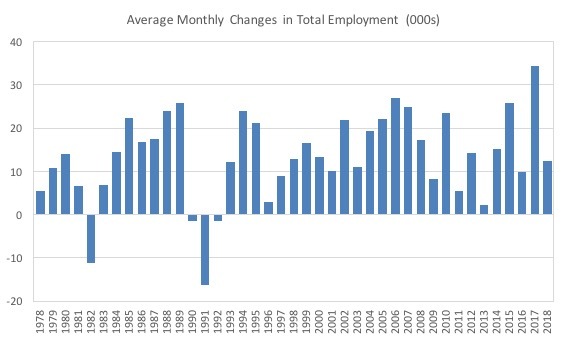 The hours data showed a sharp contraction consistent with the negative full-time employment growth. The following graph shows the monthly growth (in per cent) over the last 24 months. The dark linear line is a simple regression trend of the monthly change – which depicts an declining trend – distorted somewhat by the outlier in May 2017 (the trend would have been more sharply downward without that positive spike). Today’s figures show that the Australian labour market weakened further over the last month. Overall employment growth was tepid and was marked by a significant decline in full-time employment and a sharp fall in monthly hours worked..
Over the first four months of 2018, the labour market is decidedly weaker when compared to 2017. With relatively modest employment growth and falling participation, unemployment decreased by 26,800 and the unemployment rate fell to 5.4 per cent. But that is not a good sign. It just means that underemployment and hidden unemployment has risen as workers unable to find work have opted for part-time jobs or dropped out of the labour force entirely. The teenage labour market was the only bright spot and they dominated the weak overall employment gains. Further, underemployment rose by 19.2 thousand in the three months to May 2018 and the broad labour underutilisation rate remains high at 13.9 per cent. 1. The labour market remains stuck in a weak state. But Unemployed is Unemployed !!! … whether you are are actively or passively looking is of secondary concern for the purposes of establishing Labour market volumes. 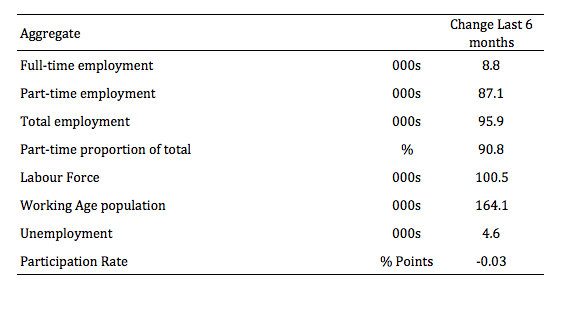 So passive unemployed are excluded from Unemployment classification within Total Labour Force, and so not considered in the actual Unemployment Rate !